Building a 40,000 square foot horse arena is not for the faint of heart, nor perhaps those with a lean bank account. But if you have a "creative ambition," a going business to cover the up-front costs, and a "let's go for it" entrepreneurial spirit, dreams do happen. At least they did for Charles and Barbara Longo of Annapolis, MD. The Longo's, ardent horse riders, formerly boarded their horses at a nearby stable. But the more they enjoyed their hobby, the more the idea of their own year-round indoor stable and a horse training/boarding school started fermenting. He reflects, "When you wish to attract people to your establishment, you want something that no one else has. You want it to be unique. When people see it, you want to hear them say "wow." So that's what guided my brainstorming on this project." "When we first started thinking about this project, ideas started locking into our brains and we developed a mental picture. We fantasized about this, and about that. Fortunately, this project came out much better than we ever visualized it to be. We simply couldn't be happier. And people do indeed say 'wow.' when they first step inside." Welcome to Hidden Springs Stable, a beautiful 200' x 200' insulated steel framed arena just 17 miles south of Annapolis. 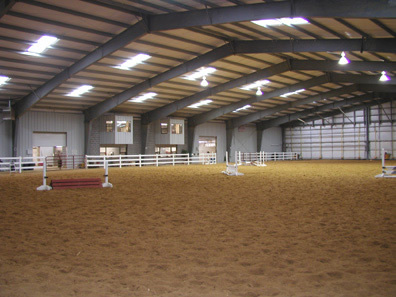 Manufactured by Steel Built Corporation, Pittsburgh, PA. Hidden Springs provides year-round indoor riding in a 130' x 200' arena, plus a 70' by 200' stable area with 50 horse stalls, 35 measuring 10' x 12' and 15 stalls with a 12' x 12' dimension for larger horses. Also under roof is a business office, indoor toilets, a 12' x 25' relaxation lounge, and perhaps most importantly, a well-equipped 12' x 25' tack room. Adding a special ambience are 24, 4' x 8' skylights and 12 lighting fixtures providing 'day light' conditions for nighttime riding. "What we have is the largest multiple-discipline arena in our area, perhaps in the state of Maryland. We teach things like hunter/jumper skills and dressage, which is the execution by a trained horse to complex movements in response to barely perceptible signals from its rider. We do showmanship. We even train barrel racing. Barbara and I do much of the instruction although we hire skilled horsemen for some of the specialty classes," relates Longo. Their love of barrel racing is partly the reason for such a large arena. "My wife and I both really enjoy the sport. It takes a quick, and fast horse. But you need a 200-foot distance to give both rider and horse a chance to really show their stuff in competitive barrel racing," notes Longo, a spry 58-year-old who readily admits his almost daily workouts on his favorite horse helps greatly maintain his own health. That 200-foot span also explains why a steel structure. The longest span his local contractor could do with wood was only 120 feet. But Longo didn't want just a big building. He also wanted a facility with "window walls" that literally opened to the outside world. Big, wide doors opening to the ridge line was his vision. 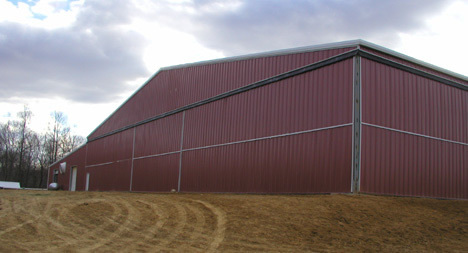 However the Overhead Door Company of Maryland could only provide doors up to 18-foot wide. They said he needed airplane hangar doors and suggested a Minnesota manufacturer called Schweiss Doors. "So I thank Overhead Door Company for putting me in touch with Schweiss. I checked the Schweiss web site and saw both bifold and hydraulic doors and most amazing, it said, 'any size you want'. Perhaps I could in fact have a 200-foot 'window wall.' And I could open three sides and truly have a fresh-air arena. People can't believe that the entire walls just disappear. It's like the best of both worlds and I've got it," says Longo. Ten Schweiss Bifold Doors, each with 18' vertical clearance, make creature comforts possible, both winter and summer. The ten bifolds totally enclose three of the four walls of the arena. Eight of these bifolds are 50-foot wide, two are 30-footers. All doors can be partially or totally opened as needed for summer air movement, or to provide visual beauty when riding inside during a rainstorm. During cold weather riders enjoy the comfort of indoor riding even during a winter snowstorm. "People are amazed when we start pushing switches and all three sides are totally open to the outdoors. They've never seen an arena like this so it really gets talked about. We have a steady stream of visitors," says Longo. He explains, "Because of the structural space between the steel rafters, we needed big doors, both 50-ft and 30-ft doors. Schweiss was willing to tailor-build each door to exactly fit our dimensions. All doors are electrically powered and feature a lift-strap mechanism so they are extremely quiet. The doors are very tight fitting. Even in the stiffest winds, there's no whistling around the edges." Jeff Dennen, former project engineer with Powerbuilt Building Systems, Virginia Beach, VA, says the installation of the doors was pretty much a straightforward process. "Any questions and we got on the phone with the Schweiss rep who could explain exactly what we needed to do. The freestanding headers made this job practical. All we had to do was some minor modifications to compensate for the additional load on the side and end walls." Hidden Springs attracts young and old, from age 3 to riders in their 80's. "Kids love to take lessons. We don't just put them on a horse, wheel them around the arena for 15 minutes and charge 20 bucks. We get them in classes so they learn a lot about horses including nutrition, anatomy, even instruction on horse safety and horse health. Then we teach good horsemanship, especially when riding with other riders. It's a complete course. Kids just love learning about horses." "Giving customers the option for specially designed doors has greatly changed the marketing world of Schweiss Doors," says Julie Shafer, Sales Team Leader. She relates that both architects and builders often want to do unique things with the doors of their project. "Our ability to custom design doors for most any project has greatly expanded the marketing geography of our company. 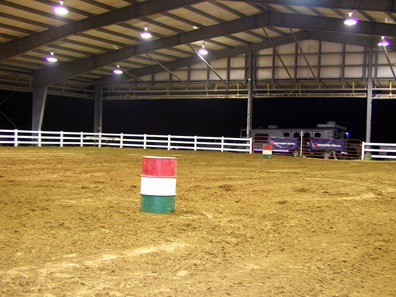 Charles Longo's horse arena is a good example. He's proud of his facility. So are we," says Shafer. Longo is owner/operator of Shippers Choice of Virginia, an instructional school that instructs would-be over-the-road truck drivers exactly how to become licensed and trained truck operators. HIs closing comment, "Our building is unique. These bifold doors get used a lot. So far zero problems. Structurally they have given our arena a special distinction."